Bebrave Textiles in The Irish Times! Sustainable fashion brands has a beautiful future! 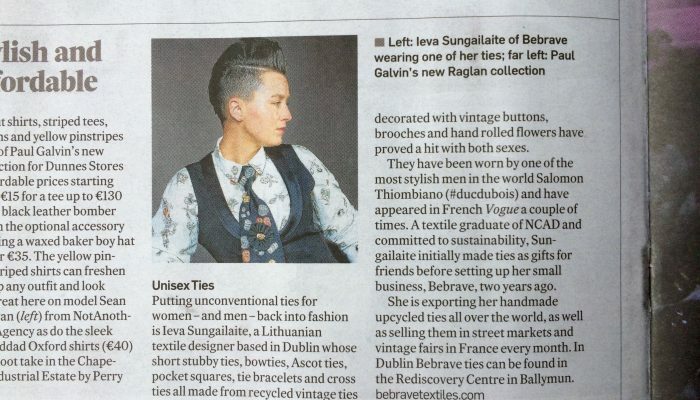 We were overwhelmed to see Bebrave Textiles in the biggest Irish Newspaper The Irish Times! It’s another step towards our dream to become a worldwide bespoke sustainable fashion accessory brand. We want to say thank you to our customers, followers, supporters and all tie lovers of the world for choosing handmade sustainable accessories.